Entrepreneur Tim Gurner is the founder of GURNERTM. He has 10 years experience in the property development industry delivering innovative, thoughtfully designed apartments and townhouses under several brands including GURNERTM and Urban Inc. 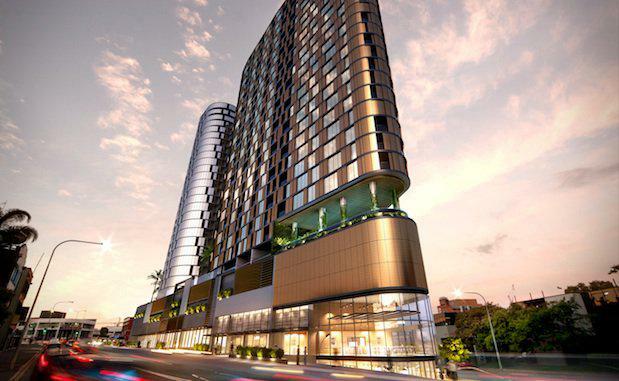 The Melbourne-based developer has recently branched out of the Melbourne market with the $600 million landmark FV project, in Brisbane’s Fortitude Valley. Tim Gurner also appeared in last year’s Business Review Weekly’s Young Rich List, placing 65th with a net worth of $26 million. What prompted you to enter the development game? I’ve always had an absolute love for property. My dad was a structural and civil engineer, my uncle ran a lot of property trusts and I guess I always grew up with property in my blood. It just felt right, I've always been a big believer in the entrepreneurial spirit and it’s what I wanted to do. I studied Commerce in Melbourne and after doing that for a couple of years I was absolutely bored. So I went part-time and did some work in property development. From there I started a gym in Elwood, it was a strange one, but it was a property play. I got a leasing in place and learnt how to be a personal trainer and sold it within 2 years. Tell us about Urban Inc. I wanted to do something a bit different so I bought site in Malvern East and developed 15 townhouses. I did that under the new brand, Urban Inc.
with Danny Ciarma, who was a 50% shareholder. Over the next 18 months, we built about 25 sites across Melbourne. It was anywhere between 17 townhouses to 240 apartments. Urban Inc. was an amazing experience and it worked really well. I started GURNERTM because I wanted to take the design quality to the next level. In the beginning of 2012, I noticed that the apartment market was maturing quite a lot. I wanted to target the owner-occupier market. I was finding that people had given up on the Australian dream of the 600sqm block and young people were looking toward apartments. We have built up over 1,600 apartments in different stages of development worth over $1.2 billion. How do you secure your sites: off market or do you compete in the market? I haven’t bought anything on-market except for one. You are competing with the Asian developers when you do that. How do you fund the soft costs and the presale commissions? Majority of it is self funded but obviously the bigger projects, like the FV in Brisbane, for example, I have funding through Thrakral. It just depends on the scale of the project. What are your criteria for selecting the design team? They have to be the best. I use Elenberg Fraser on a lot of my projects, they do my larger scale projects, but my smaller ones really depend on the project. I have actually followed one of New Zealand’s best architects, Warren & Mahoney, and brought them to Australia for a project because I couldn’t find someone with the finish that I wanted. So I will seek international architects for the look that I want. How are you responding to the location with the mix of product you're delivering? I am lucky I have a good sales network around me. I use 360 Property Group for each project - at the start of each acquisition we get them in and we talk the different locations. Something in Eastern Street in South Melbourne obviously has a different feel to Cambridge Street in Collingwood. We work out our target market and choose our architect. We create each floor plan for the exact destination. It’s all specifically targeted. What prompted the move to Brisbane with your project FV in the Fortitude Valley? I guess diversification. I always wanted to be in every state. I tried Sydney but it’s virtually impossible to buy up there. I tried Perth but I couldn’t get my head around the values. Brisbane just really made sense; it’s probably the only investment market in Australia that really has investment yields. I saw it as an opportunity to do something different and take design to another level. The level of architecture is very serious in Melbourne but in Brisbane it’s still a maturing market and you can put something out there that is different. Tell us about FV – how do you plan on selling the apartments? We will be selling them in stages. Stage one will be 350 apartments and by the end of the year we are hoping to be comfortable with that. We will then go straight into stage two which is 290 apartments. The plan is to build those two stages together but obviously that’s a large volume of apartments for Brisbane but we are offering something different to the market. With something of that scale you need to use a couple of different avenues. We will be starting pretty soon with our internal database with all of our past buyers, which we already have a huge amount of interest from. Then we will be going through our investment firms, financial planners and accountants. We will be doing a soft launch at the end of the year and then a public launch, followed by an overseas launch. How are you responding to the Asian buyer? We are certainly targeting the Asian buyer. We really are a marketing business and we just export to China. Even in Melbourne I think over 95% of our buyers are Chinese. Talk us through FV’s 6-star experience. I wanted this to be the best thing we have ever done. The key thing we try to offer is this VIP resident's area. We have a VIP club, which is a private club that is more than 3,500 square metres. It has a U-shaped pool with a pool bar, three VIP rooms that you can book out with private pools and karaoke rooms. There’s a private dining room and a really generous gym as well as some more outdoor lounge areas. Where are you drawing your inspiration for this? A lot of travelling, a lot of research and my wife has a big appetite for 6-Star hotels! We spend a lot of time doing that and I love what I do. I’m looking at what’s happening in New York in particular and learning how to better how we do it. In terms of your inspirations, what is one project that has captured you? New York's One57– they’re taking it to a whole new level that we have never seen before. I’m reading the quarterly essay about the "China - Boom or Bust” by Morry Schwartz. Where is your favourite restaurant in Melbourne? Cafe Di Stasio in St Kilda, it’s amazing Italian. What other sites do you have on the horizon? We have a new one in Kings Road, South Melbourne, that’s going to be about 55 apartments. We have another big one in Dudley Street, West Melbourne, which will be 250 apartments.